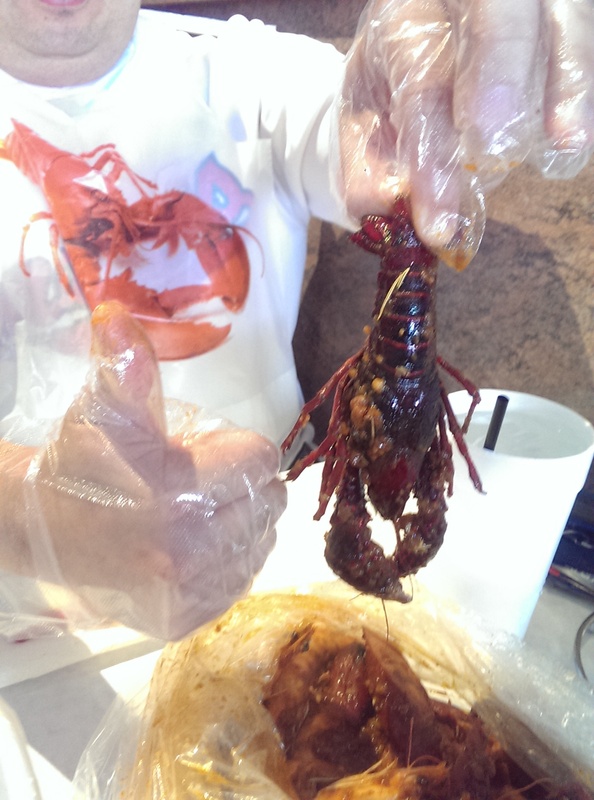 Boiling Seafood Crawfish opened on Lee Road last fall to little fanfare. One of my friends drove past and noticed it, which is how it got on my radar. I’ve been trying to get there since I heard about it. 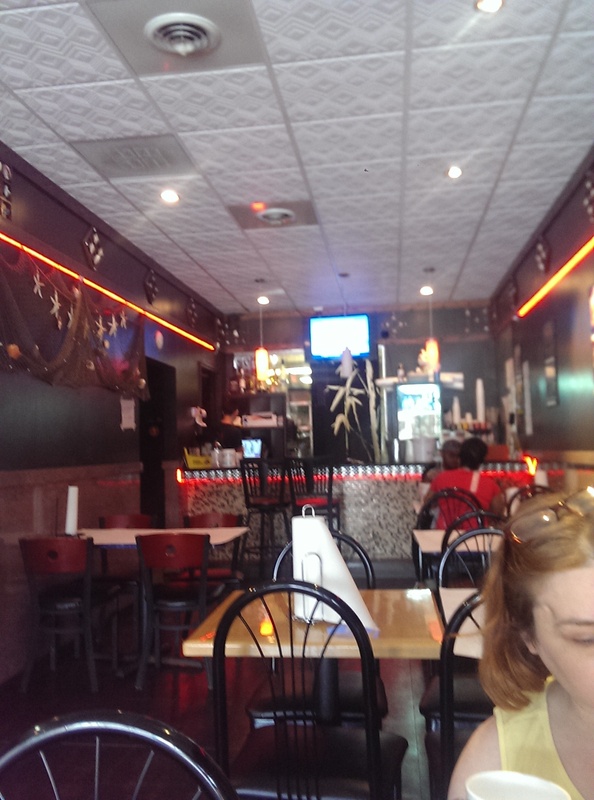 It is located on the east side of Lee next to Two Brothers (straight across from Dewey’s Pizza). Due to the road improvements, on-street parking is not available, so plan to park behind the strip in the Cedar-Lee parking lot/garage. Bring lots of quarters. We were there for an hour and a half, and my meter had just run out a few minutes before I got to my car. Luckily I didn’t get a parking ticket, which is a miracle in Cleveland Heights. One of my friends had to run out and feed the meter while in the middle of eating, so be sure to be generous with your time estimate. Better to spend an extra quarter than pay a $10 or $15 parking ticket. Unless you can pound down several pounds of seafood in one go this is definitely a place for a group. 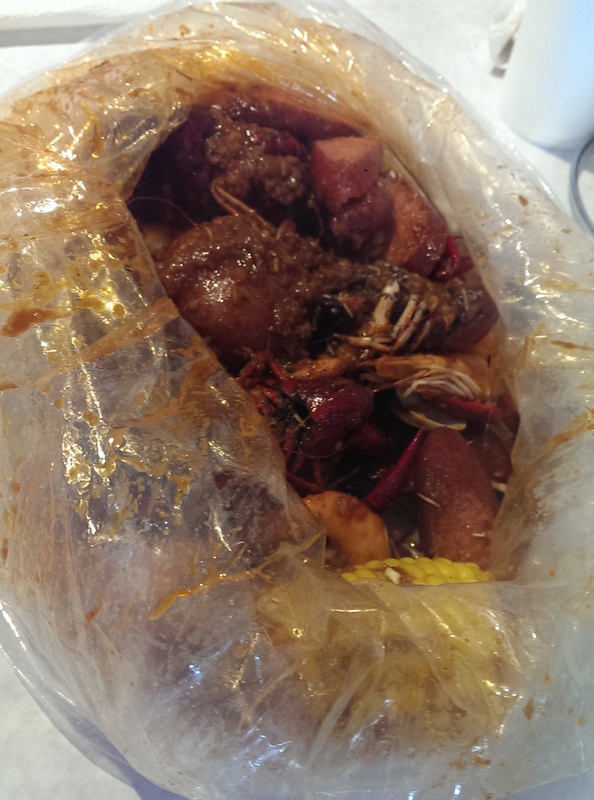 The seafood is boiled in a flavorful broth, tossed in a seasoned spice mixture of your choosing and heat level, and delivered to the table in clear plastic bags. The seasoning options are Juicy Cajun, Garlic Butter, Lemon Pepper or Homemade Juicy (which is a combination of all four seasoning) and four spice levels ranging from Baby Spice (which has almost no heat) to Spicy (five chili peppers). Note: this is not a “first date” kind of place. 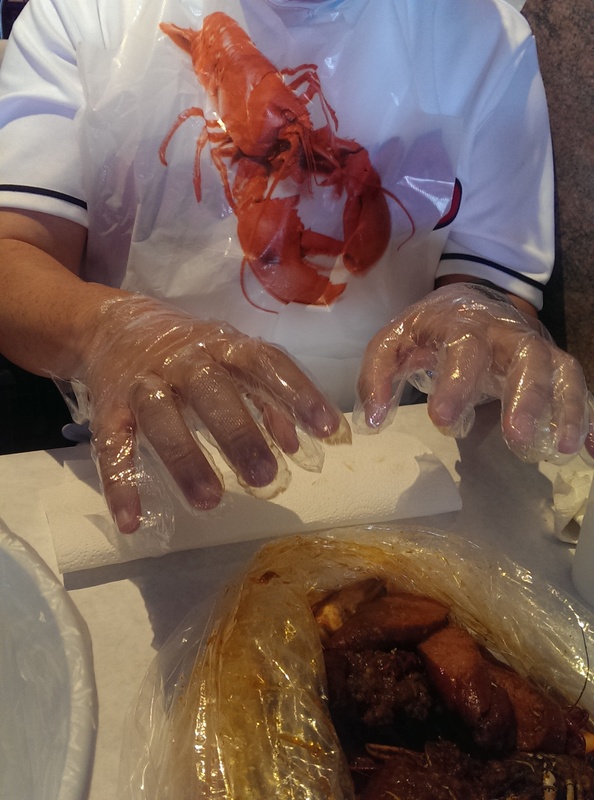 You get messy and it’s hard to look dainty when you are tearing off shells and pulling off heads or cracking crab legs. This is a place to dress down and be prepared to get covered head to toe in seasoning and juice – especially from your neighbor. They do give you plastic bibs and plastic gloves though. I was happy for the bib since I tend to wear my food even at the most gentile places, but found the glove only got in the way. I ended up going Michael Jackson-style and wearing only one glove, leaving my right hand more control of the cracking and picking out of meat. Guests can pour the contents out onto the white-paper table toppers or eat straight out of the sack. We chose to eat ours out of the bags, but I accidentally let one side down and a river of red seasoning suddenly ran down the table towards my friend and her white pants. We were able to avert disaster with lots of paper towels, which are conveniently available on the table. I ordered the corn fritters as an appetizer for the table and an order of Hawaiian sweet rolls to mop up the sauce. 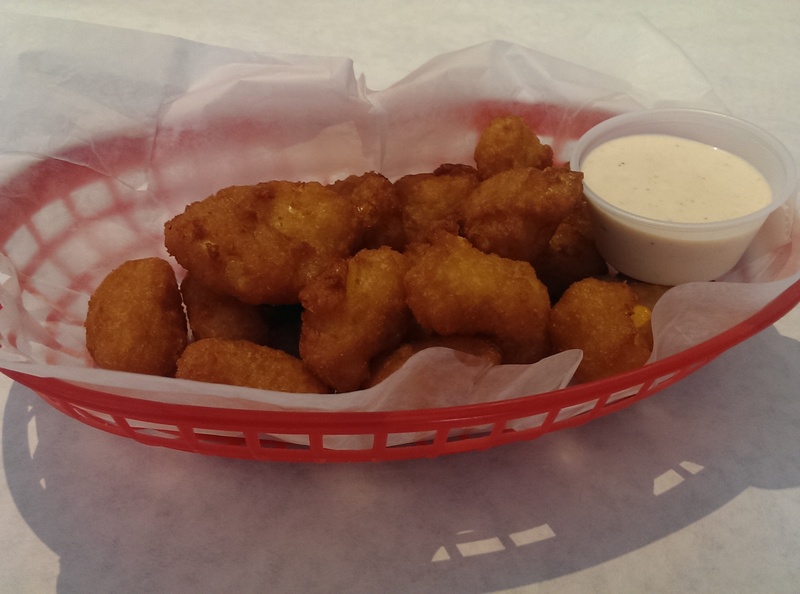 The corn fritters were creamy and perfectly fried with a nice dipping sauce. I had to force myself to stop eating them to save room for the seafood. As for the sweet rolls, they added a nice sweetness to the sauce and I’m glad I ordered them. They came three to an order, so we shared them as well. 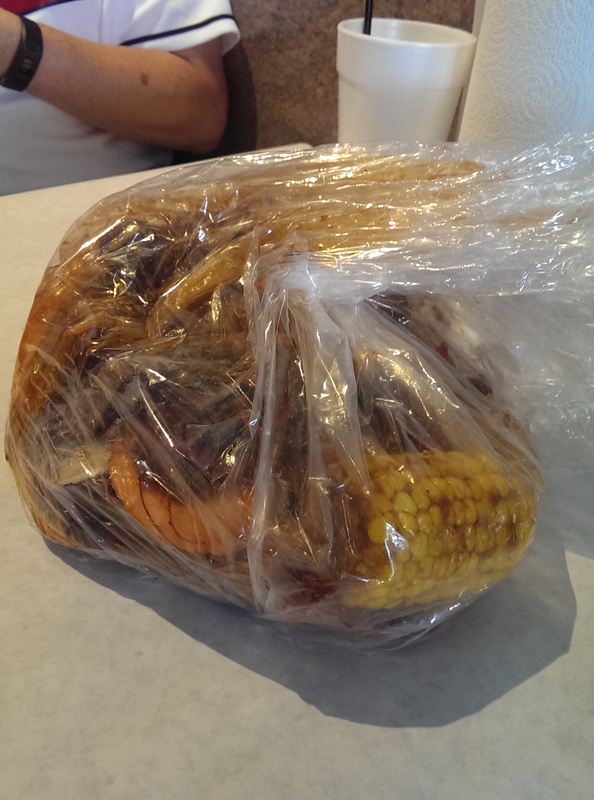 The Handful ($31) features a pound of shrimp, a pound of crawfish, a half pound of clams, a handful of andouille sausage slices, two ears of corn and two new potatoes, so it’s perfect to share between two people. My friends who can stand some heat ordered this between them and ordered it Medium. They really enjoyed it. I tried one of the shrimp, which wasn’t as spicy since they are boiled in the shell and the seasoning doesn’t penetrate. 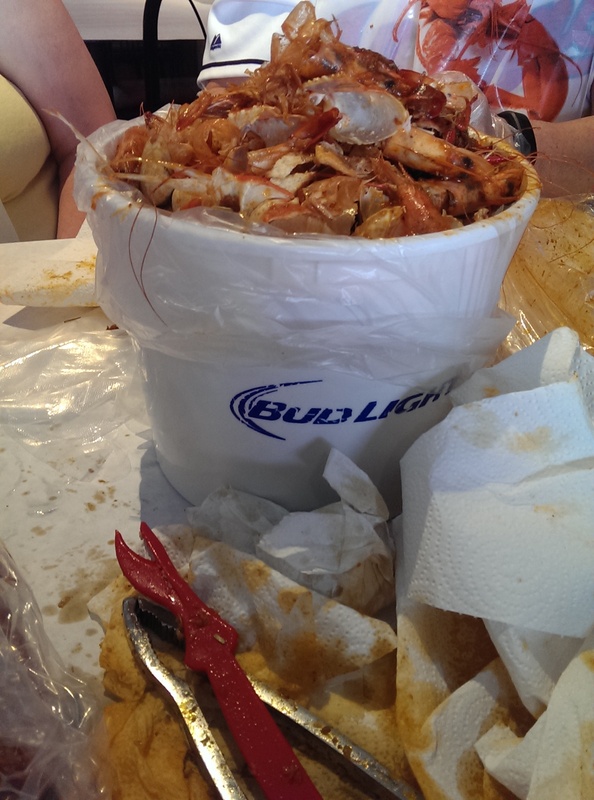 It’s best to peel or unearth the seafood and dip it in the sauce. 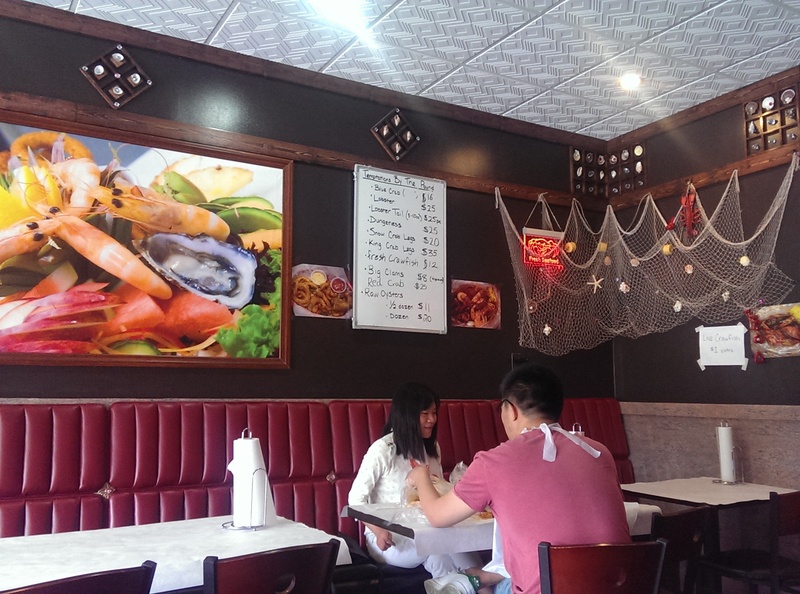 Diners can also build their own experience by ordering seafood by the pound and add-ons like corn and potatoes. I chose to go with that option since I wasn’t sharing. I ordered a whole lobster and snow crab legs with Baby Spice and Homemade Juicy. It had a really nice flavor to it, but no heat at all. I would probably get the Mild option next time. I had ordered a half pound of shrimp as well, but that hadn’t printed out in the kitchen. I was glad it didn’t because I was comfortably full when I finished. The shrimp probably would have taken me to the side of “too stuffed to move.” The lobster ended up to be a little over a pound, but one of the claws was deformed, so I ended up paying $7 for one claw on top of the $25 for the lobster tail. I’d probably opt for the tail by itself next time. 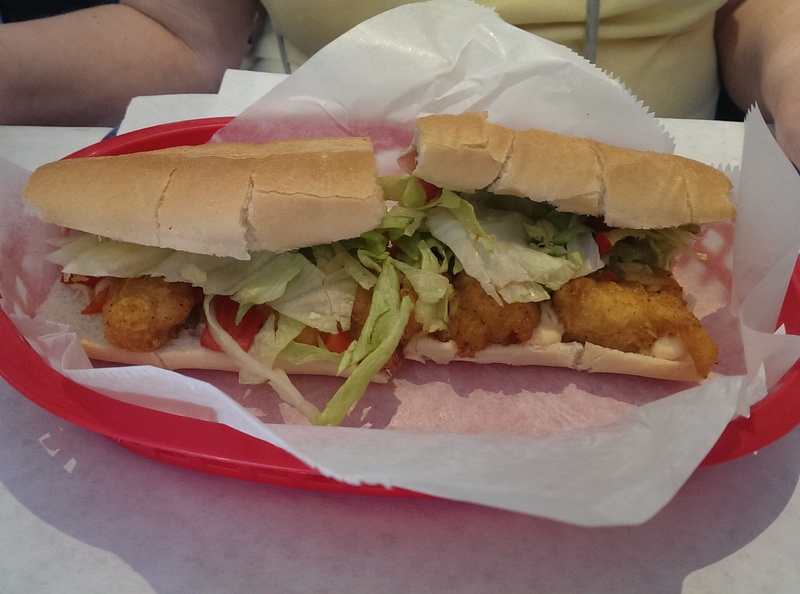 One of my friends ordered a shrimp Po’Boy, and it definitely looked delicious. She said it was very flavorful with a nice remoulade sauce and chopped green peppers, onion, tomato, and lettuce. I will definitely be trying that next time as perhaps a carry out order with some etouffee. The Po’Boys feature shrimp, crawfish, catfish, cajun chicken, soft shell crab, fried oysters and lobster. They come with or without fries. Since we met for lunch on Sunday we ordered no alcohol, but they do have a small list of alcoholic beverages to quench your thirst. I was happy with my lemonade, which came in a large styrofoam cup and was happily refilled. The server was friendly and attentive. He removed the shrimp from my order in the computer without complaint when it was pointed out to him that the order hadn’t come with any. He had offered to have them make some, but at that point I had realized that I had just the perfect amount. 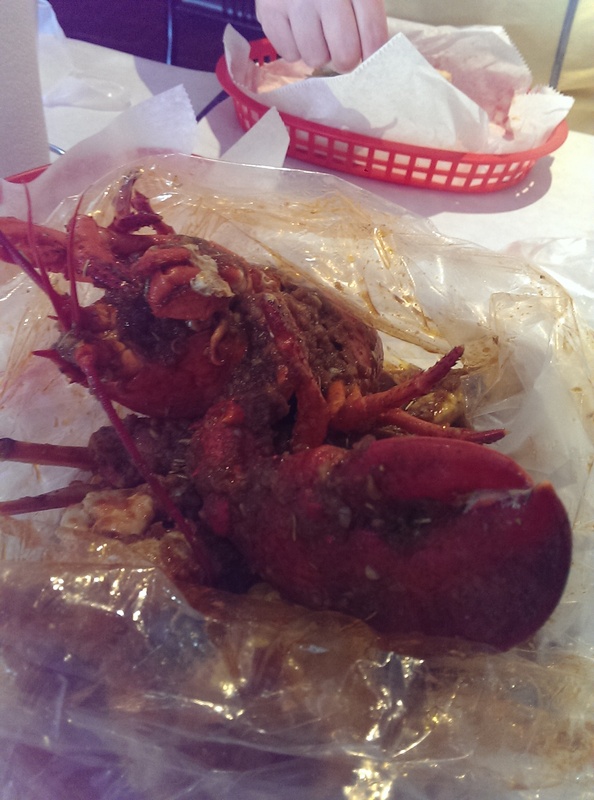 But look at the size of that crawfish!